Lone Star Rail soon could take passengers from San Antonio to destinations north along I-35 to Austin, if the city council puts initial funding in next year’s budget. A majority of San Antonio City council members seem to be on board. 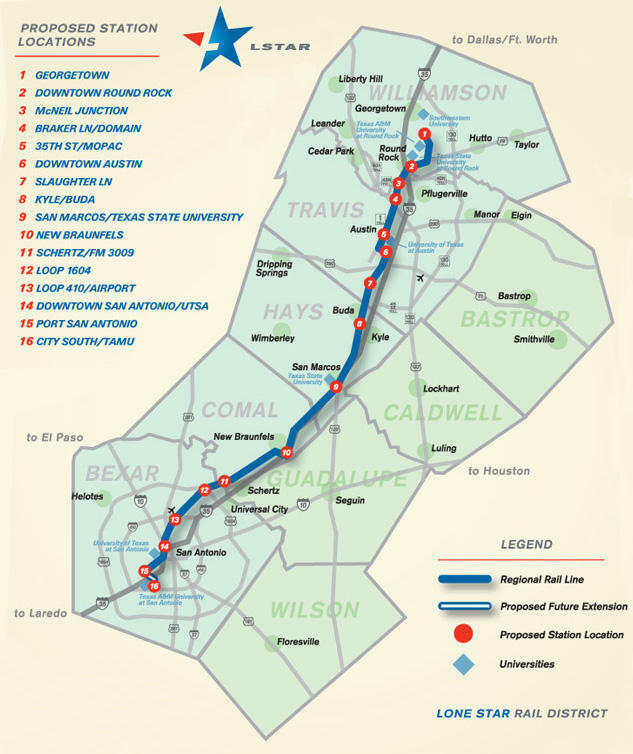 The Lone Star Rail line would connect San Antonio to Austin with a train that would stop in San Marcos and New Braunfels. To be included, the city would have to commit $500,000 in 2016. That amount goes up a little each year to at least $14.5 million by the year 2051. District 9 City Councilman Joe Krier said it needs to be a part of the budget. “We need to make sure that when the Lone Star Rail train pulls out of the station that San Antonio is onboard early in the process, that we know what our costs are, and that we have an ability to get off the train if we decide that it’s not in our best interests," Krier said. The cities of Austin and San Marcos have signed funding agreements. Tullos Wells, Vice Chair of the Lone Star Rail District, said Lone Star is in discussions with a total of 21 communities, including New Braunfels, Kyle, and Buda. ‘We expect to have every jurisdiction up and down the corridor with a local funding agreement by the end of this year," Wells said. The first trains could begin running within five years. There are several stations already proposed for San Antonio, including one at the airport. Mayor Ivy Taylor supports the project but isn’t sure the city has the money. "I think citywide people would agree that that’s something we’d like to have in order to relieve the congestion on I-35 and give people another option," Taylor said. The current city budget doesn’t include the $500,000 for Lone Star Rail. Council members have asked the city manager to see if she can reorganize the budget to include the rail project before the budget is adopted September 10.